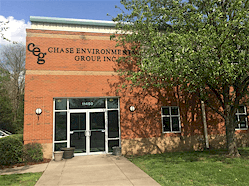 Chase Environmental Group was contracted to provide contaminated soil removal at an United States Fish and Wildlife Service (USFWS) Nature Preserve located in the Hawaiian Islands National Wildlife Refuge. The site had been the former location of a LORAN navigation station operated by the US Coast Guard until the mid 1960’s. This project was complicated due to several factors. The area excavated was located on a coral atoll located approximately 450 miles northwest of Honolulu, Hawaii. The site is managed by the USFWS and is home to several threatened and endangered species. The area to be remediated was located adjacent to the Pacific Ocean, which limited equipment mobility and access, consequently Chase constructed a retaining wall to separate the remediation area from the ocean. Chase established a grid system in the remediation area utilizing coordinates established during previous site investigations. Each grid was excavated using tracked excavating equipment. Chase placed the material into DOT approved soil bags and transported it out of the affected area using an all-terrain forklift. The bags were weighed and placed into cargo containers, which Chase then loaded onto a small lightering barge. The lightering barge transported the containers to a larger barge anchored approximately one mile offshore. The containers were transferred to the larger barge using a crane. The cargo containers were shipped to Oregon for disposal. The material excavated contained a substantial amount of debris which consisted of concrete, metal grates, glass, machine parts, metal pipes, truck axles, steel beams, and rebar. This material was segregated by hand or using the excavator and placed into separate cargo containers. Another complicating factor was the proximity of the remediation site to the ocean. The excavation was scheduled so that soil/debris were excavated near the retaining wall during periods of low tide. The material excavated near the retaining wall was stockpiled and allowed to drain prior to loading into the soil bags. After each grid was excavated, a Chase technician obtained confirmatory samples and completed field immunoassay testing using the SDI Rapid Assay PCB test kit. Over 800 tests were completed. A total of 1690 CY of non-hazardous PCB soils were disposed. There were a total of six-55 gallon drums of capacitors, transformers and batteries, which were disposed of as hazardous waste and eight drums of soil which was disposed of as TSCA waste. There were eight cargo containers of debris disposed. Contact us to see how we can be of service to you, email: Chase Environmental Group or call toll free: 877-234-5687.